Professor Joseph JaJa has been named interim chair of the Electrical and Computer (ECE) Engineering Department, effective July 1, 2018. 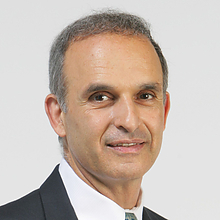 Prof. JaJa, who holds a permanent affiliate appointment in the University of Maryland Institute for Advanced Computer Studies (UMIACS), will be replacing Rama Chellappa, Distinguished University Professor and Minta Martin Professor of Engineering, who has served as chair of ECE since 2011. The ECE department is one of the largest in the A. James Clark School of Engineering, with almost 90 full-time faculty and affiliate faculty and about 50 research faculty and postdocs. "Dr. Joseph JaJa is a highly respected leader in the Clark School and University,” said Darryll J. Pines, Farvardin Professor and dean of the A. James Clark School of Engineering. “He brings great knowledge, and skill in his new role to serve the department following the inspiring leadership of Dr. Chellappa." Prof. JaJa received his Ph.D. degree in applied mathematics from Harvard University in 1977. He joined the University of Maryland faculty in 1983 and served as director of UMIACS from 1994-2004. Under his leadership, UMIACS research funding grew from $2.5M annually to more than $18M. He also served as Interim Vice President and Chief Information Officer of the University of Maryland’s Office of Information Technology from 2010-2011. Prof. JaJa’s current research interests involve big data, computational neuroscience high-performance computing, and statistical machine learning. He has published extensively in several areas, including parallel and distributed computing, and serves on several editorial boards in the computing field. He has received numerous awards including the IEEE Fellow Award in 1996, the 1997 R&D Award for the development of software for tuning parallel programs, the ACM Fellow Award in 2000, and the Internet2 IDEA Award in 2006.